YOU PROVIDE THE HUNGRY GUEST, WE PROVIDE THE REST! Welcome to Me & Lou's Barbecue and Catering, serving the beautiful Central, and Southern California Wine Country and Coastal regions. 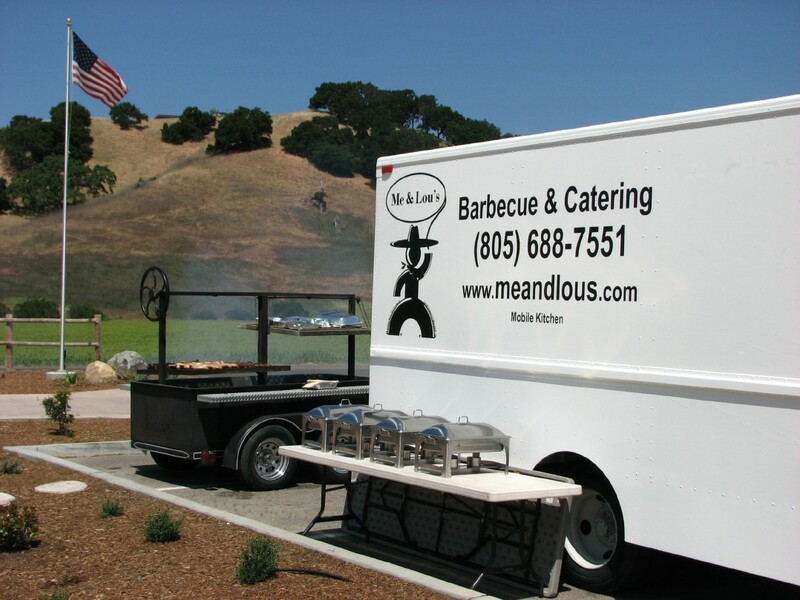 We specialize in Santa Maria Style Red Oak Pit Barbecue and full Event Catering. 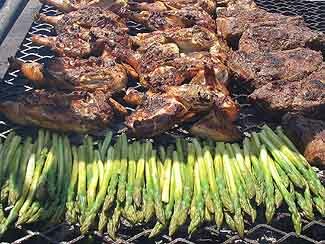 We love to Barbecue almost anything, including Beef, Chicken, Pork, Lamb, Turkey, Duck, Wild Game, a variety of Sea Food, and just about any Vegetable or Mushroom around. Santa Maria Barbecue needs a great salad. 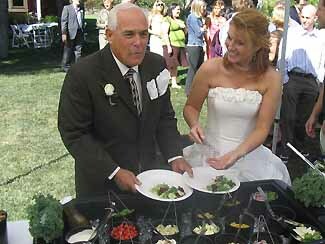 Only Me & Lou's offer a full Salad Bar with over 20 items and our own fresh homemade dressings. Complete Catering Service is available with our seasonal menu. We enjoy relationships with all the local party rental companies, and our Event Planning Service can make the arrangements for tables and seating, flatware, heaters, or reservations for some of our best party locations. We can provide all the paper products, utensils, and non-alcoholic beverages for your next party or event. You provide the hungry guests, we'll provide the rest! 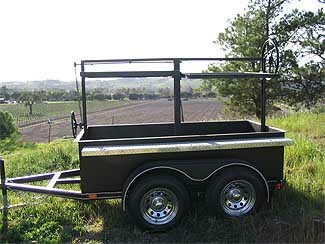 Our very popular Santa Maria Style BBQ. 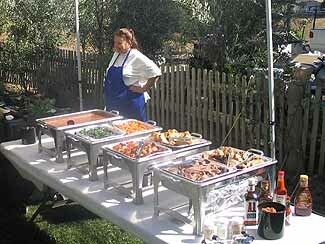 Slow Roasted Tri-Tip, tender and juicy, served with fresh Salsa and all the fixings, Slow Smoked Marinated Chicken, mouthwatering and delicious, a crowd favorite, Festive Kielbasa Sausage, Ranch Beans, Double dunk Garlic Bread, Salads with homemade dressings, paper plates and utensils, drinks and dessert. This includes all service for our buffet line. You simply provide the hungry guest, and we'll provide the rest! 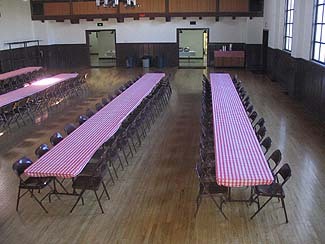 Your next Business, Safety, Employee or Annual Dinner meeting should be a Barbecue. With experience serving over 500, our Professional Staff and Servers work with you. Large Family Reunions, Tour Groups, First Release Parties at our local Wineries, Me & Lou's is ready to make your event memorable. Celebrate your Wedding in spectacular Wine Country, outdoors and with a great BBQ Dinner and Reception. Starting with Fruit, Cheese and Appetizers for wine tasting, followed by an Elegant BBQ Dinner, Champagne Toast and service for your Wedding Cake. Me & Lou's specializes in making your Wedding Day unforgettable. Offering flat fee pricing for groups under 50, or small Private Romantic Dinners at your home, no group is too small for our Full Service and Professional Catering. Send mail to info@meandlous.com with questions or comments about this web site.